"High horns, low horns, silence, and finally a pandemonium of trumpets, rattles, croaks and cries that almost shakes the bog with its nearness, but without yet disclosing whence it comes. At last a glint of sun reveals the approach of a great echelon of birds. On motionless wing they emerge from the lifting mists, sweep a final arc of sky, and settle in clangorous descending spirals to their feeding grounds. A new day has begun in the crane marsh. . .
. . .Our ability to perceive quality in nature begins, as in art, with the pretty. It expands through successive stages of the beautiful to values as yet uncaptured by language. the quality of cranes lies, I think, in this higher gamut, as yet beyond the reach of words. . .
. . .The sadness discernible in some marshes arises, perhaps, from their having once harbored cranes. Now they stand humbled, adrift in history." 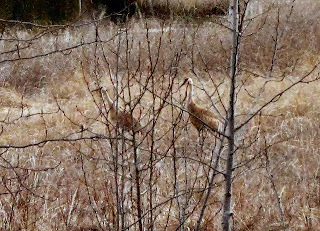 In mid-April, when the ice was just leaving, we were out walking our road and heard strange noises coming from the marshy place around the bend. 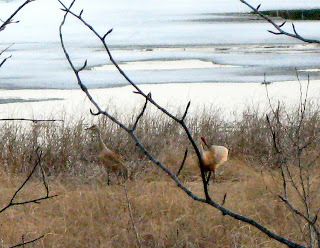 Through the bare branches, we saw two sandhill cranes--a rare sight around here. Each spring we go back to the places where we think they should be, but we haven't seen anything like that again. Now and then we hear their incredibly loud calls and run outside to watch them cruising overhead during the spring fly-0ver, but we are just a stop along the way to a more permanent summer home. I like it that way. I want to be able to be surprised by their calls and to be astonished at their size. I want their numbers to be small enough here so that we humans don't feel the need to try and feed them to keep them around, so that, ultimately, hunters won't feel the need to treat them as nuisances and have an excuse to kill them. There are elements of wildness that have nothing to do with us--that can survive very well, often better, without us--but that we crave, possibly because something in our primal, primordial past cries out to us. I think it's why so many of us choose to either live in or keep places that are inconvenient at best and crudely inadequate at worst. We crave the quiet and the tranquility of the boondocks, the wildness of nature surrounding us, and we take it wherever we're able to find it. Times are desperate here in my sad, beautiful Michigan. State unemployment rates are in the double digits, and in Detroit, once a giant among industrial cities, the number of unemployed is over 24%. Even from this distance--350 miles away and on a separate peninsula--my heart is with those people. The fear is palpable in the city. Foreclosure notices--red flags on those unfortunate doors--dot every working-class neighborhood, and there isn't a person who isn't touched in some way by the current mushrooming joblessness. In Michigan, auto-workers and other blue-collars have always headed north out of the cities to their own little patches of land. You don't have to go far in Michigan to get to where the wild things are, and for generations of factory workers, finding their own quiet breathing space was not a luxury but an absolute necessity. For every lonely hermit who goes quietly mad, a thousand city dwellers--not just in our cities here, but in every city--rage loudly, fiercely, dangerously into insanity. The wilderness, the quiet places, are there to quell that rage, to soothe their fears, to give them respite, even for a few hours or days. There are people in power who don't understand this need, and I might feel sorry for them if not for the fact that their cluelessness often means a surrender of our wild places to corporate interests. Any of us who value these quiet places of inordinate beauty, these sanctuaries for the human soul, cannot afford to let that happen. "Something will have gone out of us as a people if we ever let the remaining wilderness be destroyed; if we permit the last virgin forests to be turned into comic books and plastic cigarette cases; if we drive the few remaining members of the wild species into zoos or to extinction; if we pollute the last clean air and dirty the last clean streams and push our paved roads through the last of the silence, so that never again will Americans be free in their own country from the noise, the exhausts, the stinks of human and automotive waste." Very beautiful Ramona. The pictures are beautiful. 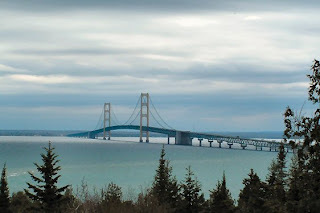 My husband went to high school in Detroit in the mid-70's, he graduated from George A. Dondero HS, Royal Oak, a good middle class town filled with engineers and other professionals who worked for the auto industry. It sure looks different now than it did then. I went to HS in Southfield and worked at Bell Telephone in Royal Oak after I graduated. Royal Oak is actually a small hidden jewel, surviving the downturn quite well, it seems. We drove through there about a month ago and I was happy to see it all spiffed up and looking pretty good. Many of the old landmarks were still there, including the theaters (and the house where I took singing lessons). It's a blue-collar town that made it, and I think the reason might be because it has a great downtown. Detroit and its environs suffer from a lack of rapid transit, but Royal Oak doesn't seem to notice. I love the bridge depiction. Thanks, DD. Did I tell you how glad I am to see you back here? Well, I am. It's gorgeous, Ramona. A cousin of mine was the guy who did the whooping crane mating dances, when there were too few males and they desperately needed eggs, if you remember that story? And yes, the fear is palpable. And when afraid, people tighten up. They stop spending, investing, risking, hoping. They fear any change that isn't couched as "going back." Dreadful - in it's literal meaning. I hope time in nature enables us to let go of some of that, to see some larger and longer cycles, to recognize that change and grow and risk-taking must go on. But mostly, lovely pics of the cranes! Quinn, I don't remember the story, but wouldn't the Creative Corner be a great place for it? I would love to read it. We in Michigan have a long history of dependence on the auto industry. Whole generations worked in the plants or in the supporting businesses, and, yes, it's hard to get past that and move on--especially when there are no other jobs out there waiting to fill in the gaps. But you can't take away the beauty of Michigan, and I think that's why so many stay put and can't think of living anywhere else. You can be out of the cities in a matter of minutes and then it's a whole other world. That is the balm so many desperately need right now. Ohhhh. It's so soothing over here on this post, Ramona. 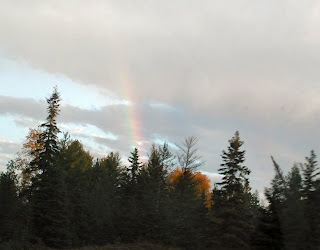 Migwetch. 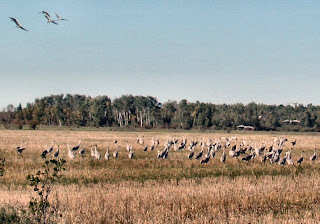 We are in the migratory path of the Sand Hill Cranes, too! One year we had some pairs stay back near the woods where the stream comes out and raise families. But, mostly they visit a while, have a nosh, then move on. Mr. flowerchild and I got to see them do their dance, too. Mr. flower had a pair of binoculars which he would not share with me. hahahahaha Stinker. Anyway, we always look forward to hearing them call in the springtime. This was great. Oh, Flower, I would love to see crane babies! When we saw the group in the farmer's field, we could tell that some were young but there were no chicks, since they were on the move. 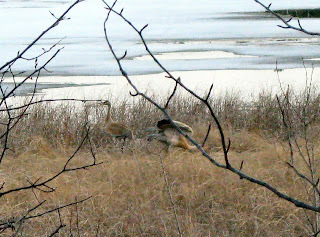 We were hoping that crane pair would settle in the marsh but we never saw them there again. Still, it was one of those moments. . .
Lovely. You ought to do a webpage on this.